Oh I do love a pair of animal print ballet pumps and these from Redfoot Shoes are no exception. If , like me you’ve been looking for a comfortable pair of folding ballet pumps to pop in your bag for when the high heels get too much then look no further. Features onAir – a hidden 1cm foam wedge in the heel for luxurious comfort and support. You can literally fold them in half, pop them in the pouch supplied, and slip them into your bag. Great for when you’re on a night out and you know you won’t last in the high heels. Or wear them on on the train to work , and slip on your heels when you get to the office. 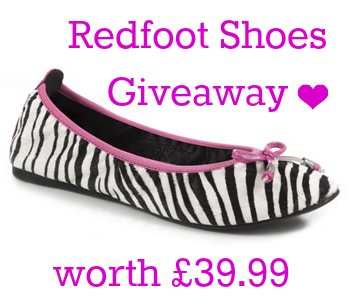 Tweet the following: “Win a Pair of Redfoot Folding Ballet Shoes worth upto £39.99 with @lovechicliving” and leave a comment below letting me know that you’ve done it. Please leave a separate comment for each entry that you do or they can’t count! The giveaway is open until Midnight on 31st January. The winner will be chosen by random and contacted by email. Full Terms and Conditions: UK entries only. Entrants must tweet the entry text for entry into the giveaway. Entrants may also like Redfoot Shoes on Facebook, Like Love Chic Living on Facebook and Subscribe to Love Chic Living by email for extra entries. They must leave a separate comment stating they have done this. The competition will close at Midnight on 31st January 2013. The winner will be chosen by Random Number Generator and contacted by email. The winner’s name will then be posted on the blog. Please leave contact details. The winner should respond within 7 days of being contacted. If no response is received Love Chic Living will chose another winner. The prize will be sent direct from Redfoot Shoes once the winner has responded. Love Chic Living’s decision is final. Disclosure: I was given a pair of Ballet Pumps to review for this post free of charge. The comments and opinions however are honest and genuine. tweeted @cabincrew73 – great sale BTW! Oh YES I do love to wear a pair of animal print ballet pumps from Redfoot Shoes………….THEIR FAB!!!! I’ve retweeted 🙂 sophieeew_91 Good luck everyone! I’ve tweeted from @feistytapas. Fab comp! Tweeted as @mweston13, hope it worked twitter is a bit busy on this #snowday! Tweeted as @janeyliz9 Fabulous prize. Fingers crossed. Like Redfoot shoes on Facebook. I love these shoes, just what I’ve been looking for! Lovely prize, they have some great designs. I reckon my feet would be very happy in a pair of these!! I have liked Redfoot Facebook page. I have liked Chic Living Facebook page.